The next three days consist of field training to reinforce some of the skills learned on the course in the UK, and also to practice some skills such as ice axe arrests that can only be done in the snow. 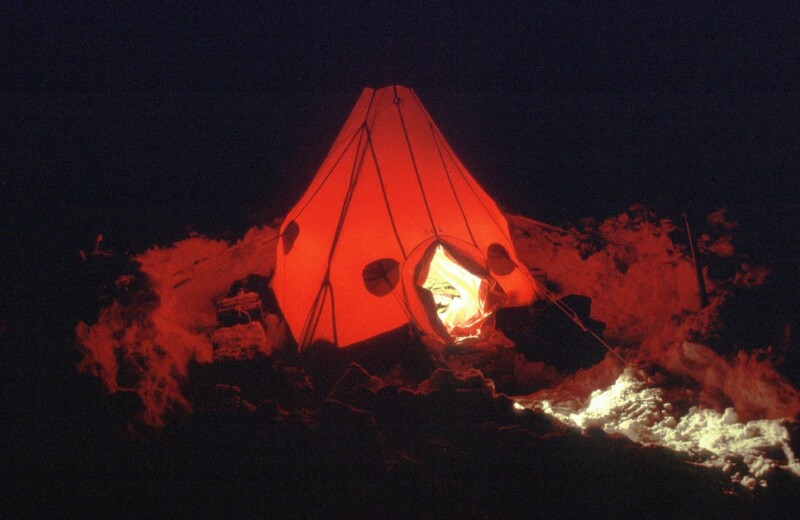 You also have the opportunity to spend a night up on the skiway in one of the BAS pyramid tents. This design of tent that has been used right from the start of Antarctic exploration 100 years ago. It is a design that is very well suited to the rigours of Antarctic weather and especially the high winds frequently encountered. Camping in the pyramid tent is actually quite warm – on top of the groundsheet there is a foam mat, followed by a self-inflating thermarest camp mat, followed by a sheepskin rug, then an arctic grade sleeping bag around which is a thick cotton bag to protect the sleeping bag from fire. Inside the sleeping bag you can also put a wool bag to increase insulation and a cotton liner to keep the bag clean. You spend a memorable second night in Antarctica in a tent a few miles from Rothera with breathtaking views over the iced-over Laubeuf Fjord across to the mountains of the Arrowsmith Peninsula, part of the Antarctic mainland, and down to Pourqoui Pas Island. The sky is wonderfully clear; an azure blue with a pink and orange glow suffusing the mountains in the distance as the sun dips below Reptile Ridge. A full moon hangs imperceptibly over the mountains to the northeast; it’s quiet like you’ve never before encountered; a total absence of background noise. Following the night camping, you start two very enjoyable days of ‘jingly-janglies’ – so called because of the clinking sound you make walking when wearing the climbing harness with all the ice screws and climbing equipment. Jingly-janglies build on the skills taught on the field course back in England, consisting of basic rope and snow/ice work designed to help you protect yourself and others. You practice walking roped-up with someone else in an alpine pair, ice axe arrests for stopping when you fall down snow slopes, crevasse rescue, snow and ice anchors, use of ice screws and rock pegs, plus the correct use of crampons and ice axes. Crevasse rescue field training near Rothera Research Station. The crevasse rescue is enormous fun as one of you jumps down a windscoop several times, simulating falling into a crevasse; admittedly one with relatively gentle sloping sides. The other person in your alpine pair then has to use their ice axe to help brake the fall, place one of the many types of snow or ice anchors then transfer the the weight onto the anchor. 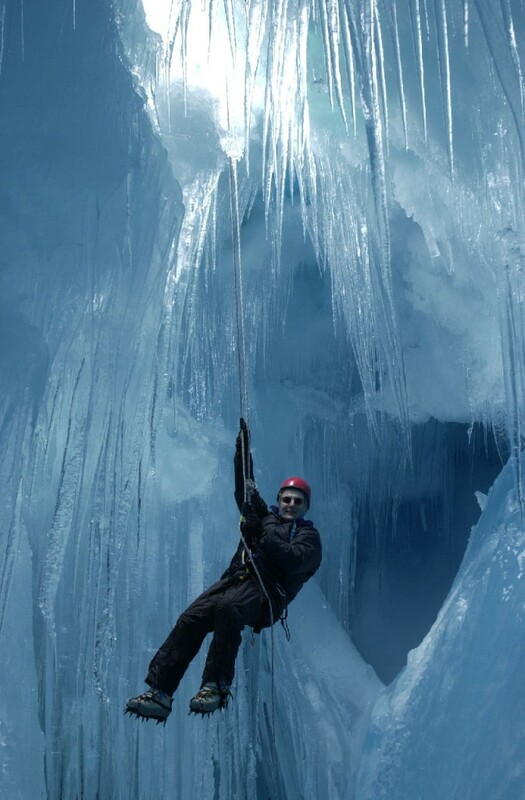 The person who fell into the crevasse could then climb out, or if the casualty was unconscious or unable to climb out unaided, a Z-pulley system could be constructed from the jingly-jangles to winch the casualty up. Having completed all your training at Rothera, you can now travel in the field in groups, or head up the ice ramp on your own to certain designated safe areas.